Those who worked with me either displayed various degrees of agreement, but more often of annoyance, on me pushing this topic as growing part of data engineering discipline, but I truly believe in it. But before we start combining all these areas and do something useful in code I will spend some time here with most basic concepts of what I am about to enter here. But why containers if I already have VMs? What this means in practice is you can put two to three times as many as applications on a single server with containers than you can with a VM. In addition, with containers you can create a portable, consistent operating environment for development, testing, and deployment. On Linux, containers run on top of LXC. This is a userspace interface for the Linux kernel containment features. It includes an application programming interface (API) to enable Linux users to create and manage system or application containers. Docker is an open platform tool to make it easier to create, deploy and to execute the applications by using containers. You will build Docker images using Docker and deploy these into what are known as Docker registries. When we run the docker pull and docker run commands, the required images are pulled from our configured registry directory.Using Docker push command, the image can be uploaded to our configured registry directory. Finally deploying instances of images from your registry you will deploy containers. We can create, run, stop, or delete a container using the Docker CLI. We can connect a container to more than one networks, or even create a new image based on its current state.By default, a container is well isolated from other containers and its system machine. A container defined by its image or configuration options that we provide during to create or run it. That brings us to container orchestration engines. While the CLI meets the needs of managing one container on one host, it falls short when it comes to managing multiple containers deployed on multiple hosts. To go beyond the management of individual containers, we must turn to orchestration tools. Orchestration tools extend lifecycle management capabilities to complex, multi-container workloads deployed on a cluster of machines. Kubernetes. Almost a standard nowdays , originally developed at Google. Kubernetes’ architecture is based on a master server with multiple minions. The command line tool, called kubecfg, connects to the API endpoint of the master to manage and orchestrate the minions. The service definition, along with the rules and constraints, is described in a JSON file. For service discovery, Kubernetes provides a stable IP address and DNS name that corresponds to a dynamic set of pods. When a container running in a Kubernetes pod connects to this address, the connection is forwarded by a local agent (called the kube-proxy) running on the source machine to one of the corresponding backend containers.Kubernetes supports user-implemented application health checks. These checks are performed by the kubelet running on each minion to ensure that the application is operating correctly. Apache Mesos. This is an open source cluster manager that simplifies the complexity of running tasks on a shared pool of servers. A typical Mesos cluster consists of one or more servers running the mesos-master and a cluster of servers running the mesos-slave component. Each slave is registered with the master to offer resources. The master interacts with deployed frameworks to delegate tasks to slaves. Unlike other tools, Mesos ensures high availability of the master nodes using Apache ZooKeeper, which replicates the masters to form a quorum. A high availability deployment requires at least three master nodes. All nodes in the system, including masters and slaves, communicate with ZooKeeper to determine which master is the current leading master. The leader performs health checks on all the slaves and proactively deactivates any that fail. 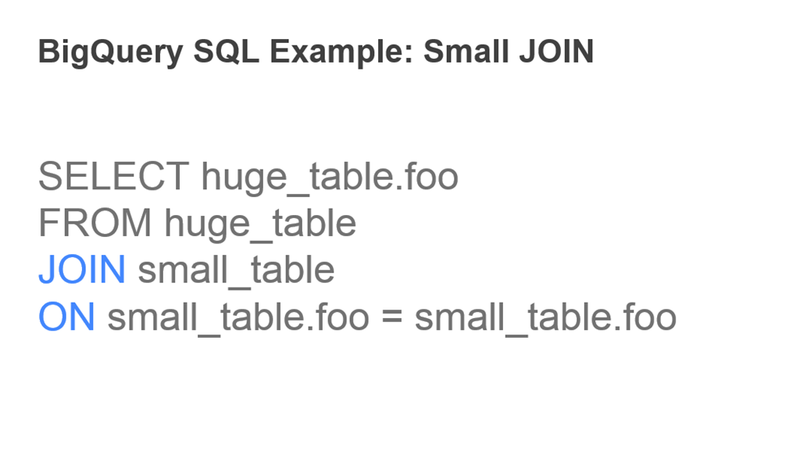 Over the next couple of posts I will create containers running SQL Server and other data stores, both RDBMS and NoSQL, deploy these on the cloud and finally attempt to orchestrate these hopefully as well. So lets move off theory and pictures into world of parctical data engine deployments. Hope you will find this detour interesting. 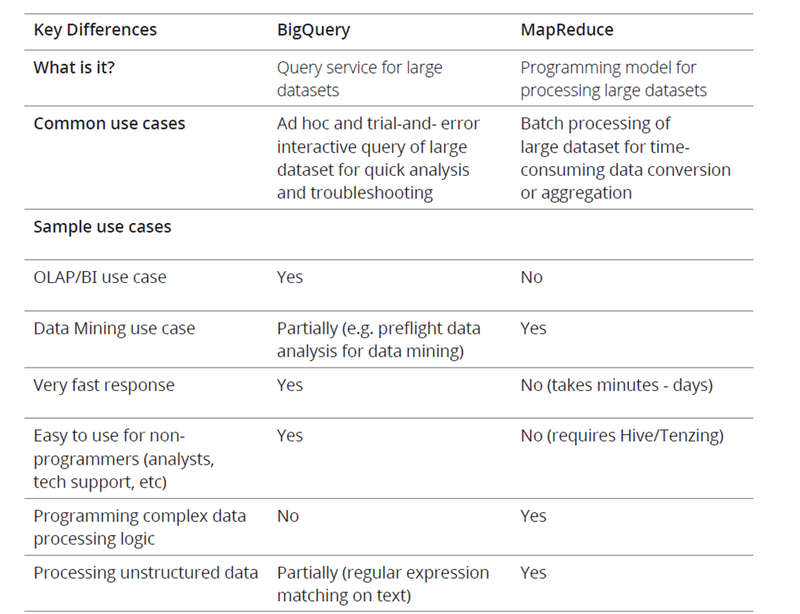 Although I am mainly Microsoft and Azure centric guy,after reading a bit on Google Big Query it got me interested. Therefore I decided to explore it a bit more as well here. BigQuery is a RESTful web service that enables interactive analysis of massively large datasets working in conjunction with Google Storage. It is an Infrastructure as a Service (IaaS) that may be used complementarily with MapReduce. 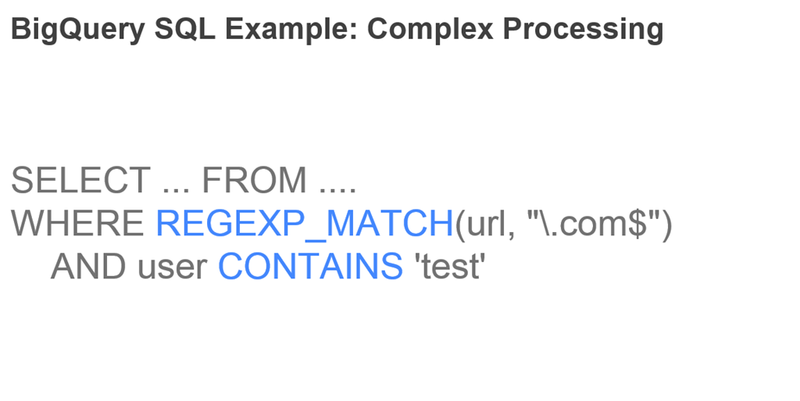 BigQuery (BQ) is reportedly based on Dremel,a scalable, interactive ad hoc query system for analysis of read-only nested data. To use the data in BigQuery, it first must be uploaded to Google Storage and in a second step imported using the BigQuery HTTP API. BigQuery requires all requests to be authenticated, supporting a number of Google-proprietary mechanisms as well as OAuth. maintaining the unprecedented query performance of Dremel. Tree Architecture is used for dispatching queries and aggregating results across thousands of machines in a few seconds. Traffic minimization. Only required column values on each query are scanned and transferred on query execution. For example, a query “SELECT top(title) FROM foo” would access the title column values only. Higher compression ratio. 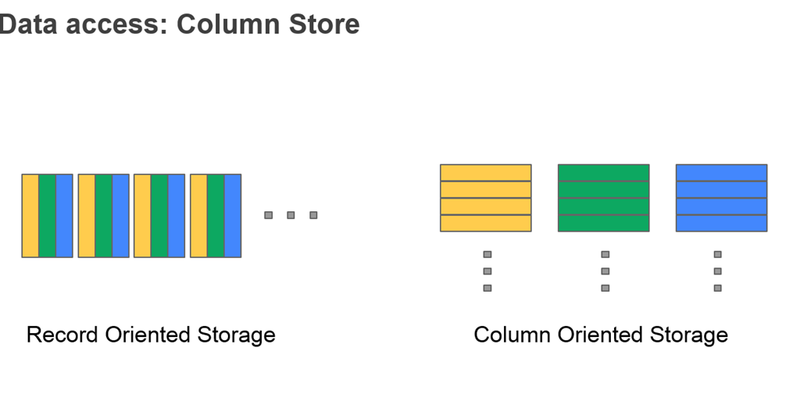 One study reports that columnar storage can achieve a compression ratio of 1:10, whereas ordinary row-based storage can compress at roughly 1:3. Because each column would have similar values, especially if the cardinality of the column (variation of possible column values) is low, it’s easier to gain higher compression ratios than row-based storage. Columnar storage has the disadvantage of not working efficiently when updating existing records. In the case of BigQuery, it simply doesn’t support any update operations. Thus the technique has been used mainly in read-only OLAP/BI type of usage. 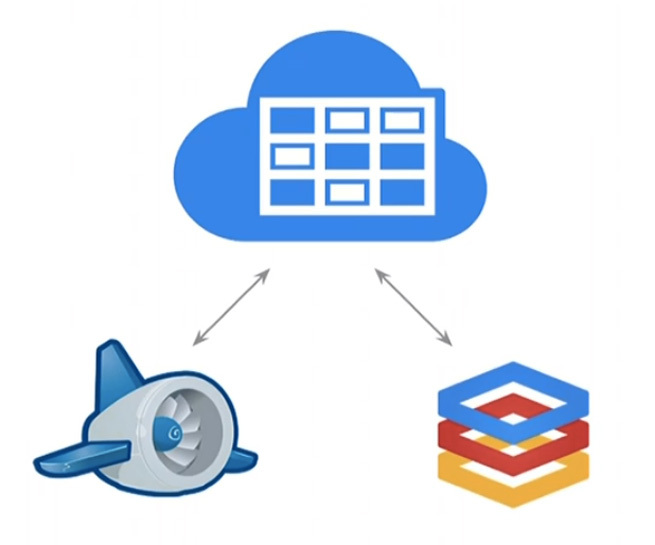 Although the technology has been popular as a data warehouse database design, Dremel\BigQuery is one of the first implementations of a columnar storage-based analytics system that harnesses the computing power of many thousands of servers and is delivered as a cloud service. One of the challenges Google had in designing Dremel\BigQuery was how to dispatch queries and collect results across tens of thousands of machines in a matter of seconds. The challenge was resolved by using the Tree architecture. 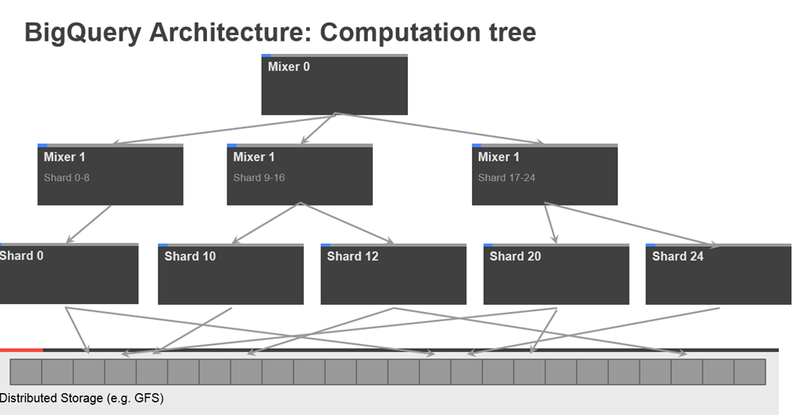 The architecture forms a massively parallel distributed tree for pushing down a query to the tree and then aggregating the results from the leaves at a blazingly fast speed. 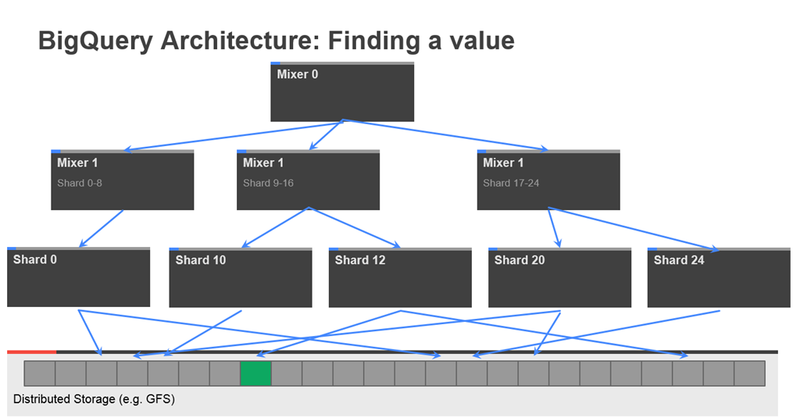 By leveraging this architecture, Google was able to implement the distributed design for Dremel\BigQuery and realize the vision of the massively parallel columnar-based database on the cloud platform. BigQuery provides the core set of features available in Dremel to third party developers. It does so via a REST API, command line interface, Web UI,access control, data schema management and the integration with Google Cloud Storage. BigQuery and Dremel share the same underlying architecture and performance characteristics. Users can fully utilize the power of Dremel by using BigQuery to take advantage of Google’s massive computational infrastructure. This incorporates valuable benefits like multiple replication across regions and high data center scalability. Most importantly, this infrastructure requires no management by the developer. Ok, how do I use it? Assuming you already have Google Cloud account you will have to create a new project from the dropdown in your Google Cloud Console. 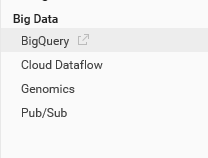 Now in you left side menu you can pick BigQuery from Big Data offerings. For now I will settle on the second choice. I will pick Shakespeare dataset here, This dataset contains the words in Shakespeare’s works, the word_count for each word, in which corpus the word appears, and the date the corpus was written. First I will issue a simple SELECT. SELECT is the most basic clause and specifies what it is that you want to be returned by the query. FROM specifies what dataset we are using. Let’s switch gears. Say we want to count something – say, the number of words in Shakespeare’s works. Luckily, we have word_count, which represents how many times a particular word appeared in a particular corpus. We can just sum all of these values, and we are left with the total number of words that he wrote. 945,845 words! Pretty good – but there must surely be some duplicates. How would we query the number of unique words that he used? Here we use the COUNT function to count how many words there are, and group them by word so as not to show duplicates. 32,786 unique words. Moreover I order these by mostly used words in descending order. In the next part I am planning to upload a dataset and do some joins and more complex processing. I realize that this post is pretty basic, however I think it may be useful to someone starting to develop Web applications on Google App Engine. 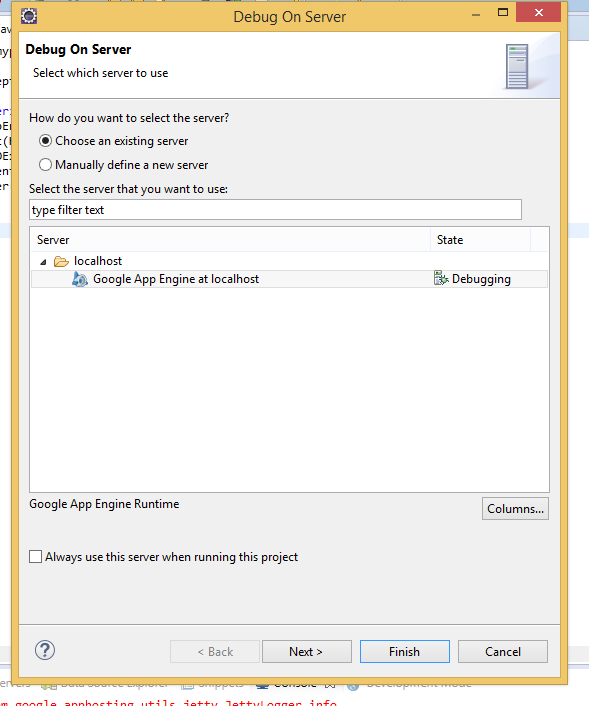 In my previous post I shown you how you can use NetBeans to develop for App Engine, this time however I will use Eclipse as with real Google plug-in it’s a lot more slick, despite my preference for NetBeans as Java IDE. In general I am a server side vs. UI guy so my servlet will be very basic, but that I don’t think is the point here as servlets in general are quite easy to do and make more more functional. Now on to Java Servlets. Java servlet is a Java programming language program that extends the capabilities of a server. Although servlets can respond to any types of requests, they most commonly implement applications hosted on Web servers. Such Web servlets are the Java counterpart to other dynamic Web content technologies such as PHP and ASP.NET. The project-creation wizard also provides an index.html file that has a link to the new servlet. Hit dropdown arrow and you can setup local server for debugging. If your application uses App Engine but not GWT, the only indication that the App Engine development server is running will be output in the Console view. 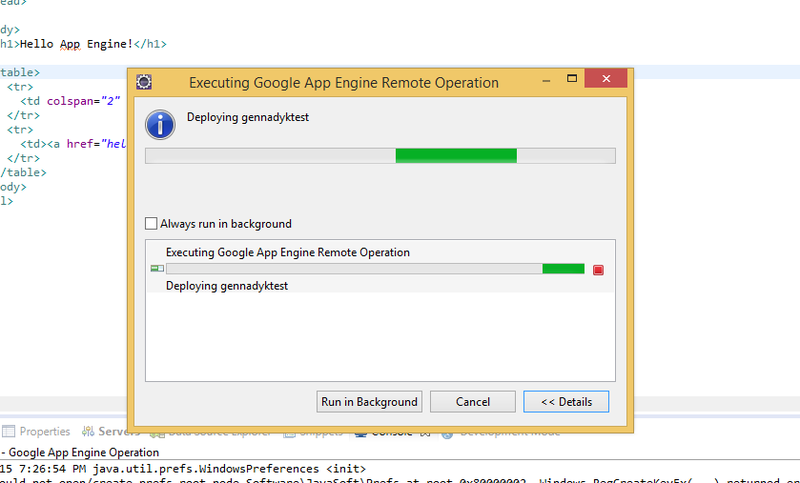 App Engine-only launches will not appear in the development mode view. The console output includes the URL of the server, which by default is http://localhost:8888/. 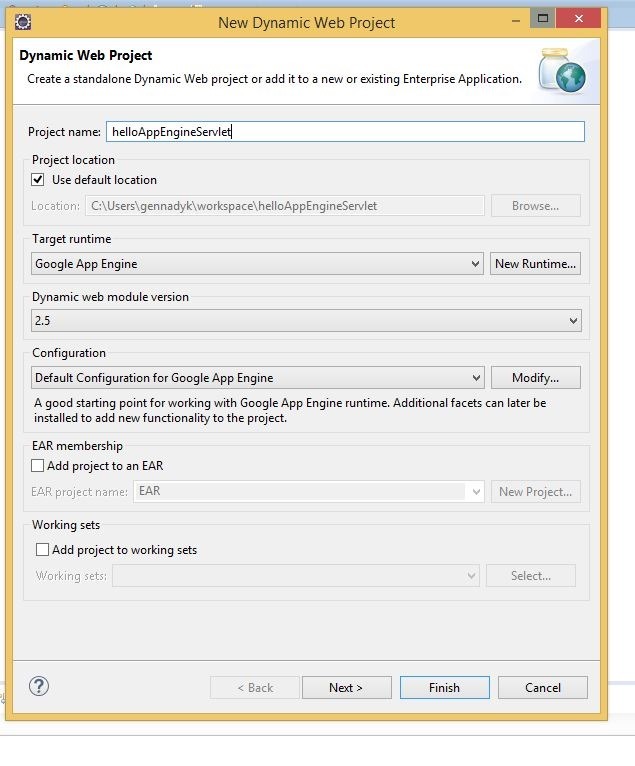 You can change the port number via Eclipse’s launch configuration dialog by selecting your Web Application launch and editing the Port value on the Main tab. 28% Cloning 3 static files. 31% Cloning 13 application files. 80% Sending batch containing 4 file(s) totaling 5KB. 95% Closing update: new version is ready to start serving. Update for module default completed successfully. Now let me open my browser and go to App Engine Console at https://appengine.google.com/. Did a bit of digging and here is what I found out. Although I am fairly Microsoft centric and Azure centric in my interests I have decided to give a quick try to a competing alternative using language that I am familiar with – Java and IDE that I know fairly well for it – NetBeans. 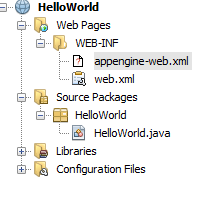 I wanted to try something quick and easy, but my first task was making sure that NetBeans actually can deploy code to AppEngine. Good news there is a plug-in for Google AppEngine available from this Kenai Project – https://kenai.com/projects/nbappengine/pages/Home. First things first. 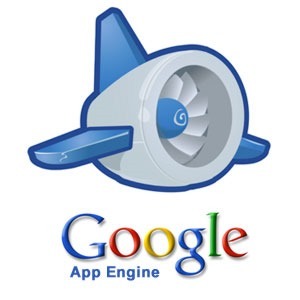 Navigate to developers.google.com and sign up to enable your Google Account for use with Google App Engine. Create a project, make sure you write down Project ID and name. 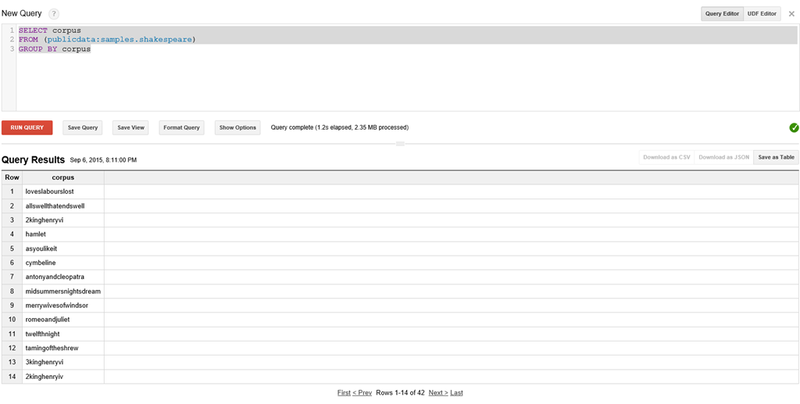 Download and unzip the Google App Engine SDK to a folder on your hard drive. Obviously here I am using Java SDK. Now, I will assume that you have NetBeans already installed. If not it can be installed from here – https://netbeans.org/ . It is my favorite IDE when it comes to non-Microsoft or Java IDEs at this time. 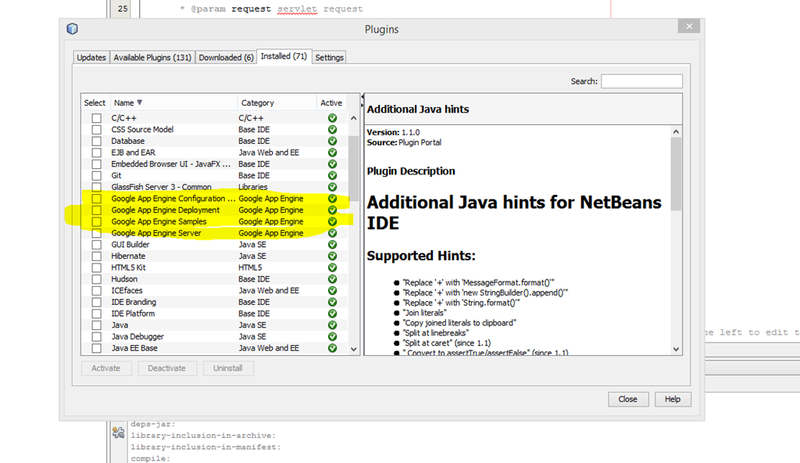 If you’re using NetBeans 6.9 you must also install the Java Web Applications plugin for NetBeans. 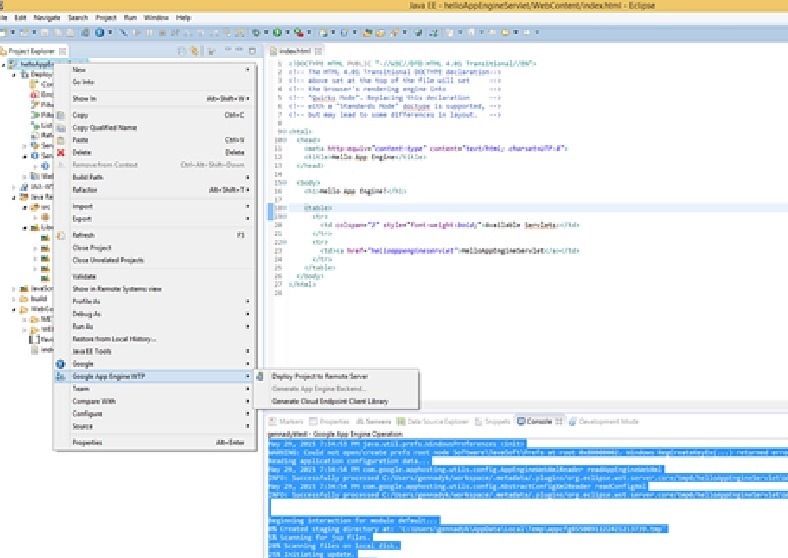 Frankly the experience for me wasn’t as seamless as I would like (perhaps I am spoiled a bit by Visual Studio Azure SDK integration for Azure PaaS), I may have had an easier time with official Google plugin and Eclipse, but as stated I like NetBeans more.